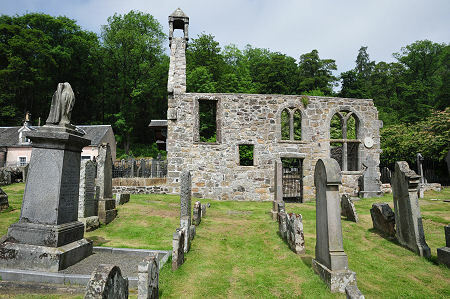 Logie Old Kirk can be found on the north eastern edge of Stirling, not far from Stirling University. Logie Parish Church, which was built in 1805, lies just off the B998 near its junction with the A91. Logie Old Kirk stands beside the same minor road as its replacement, but some three hundred yards further up the hill. Parking is very limited at the Old Kirk, and a better bet is to leave your car in the large car park near the parish church and walk. The newer Logie Parish Church also looks interesting, but was not open to visitors when we were there. 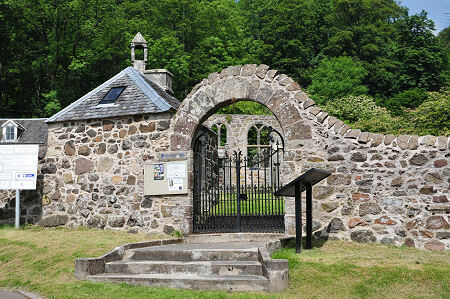 You know you've arrived at Logie Old Kirk when you see the arched gateway in the kirkyard wall. The wall has been beautifully repointed in recent years, as part of a community project run by the Logie Old Graveyard Group. This involved the removal of years of overgrowth from the remains of the kirk itself and from many of the gravestones, as well as the restoration of the watch hut beside the gateway, plus consolidation and repair of all of the walls on the site, especially those of the kirk itself. The result is a real triumph of local commitment and enthusiasm, and for the first time in a very long time the old kirk and kirkyard can be properly appreciated by visitors. 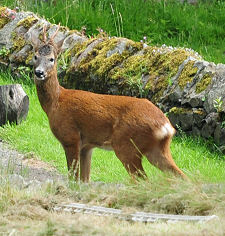 The Parish of Logie is among the oldest in Scotland, being established during the reign of King David I from 1124 to 1153. The first church serving the parish was dedicated to St Serf and dates back at least as far as 1183, when it was referred to in a charter by Bishop Simon of Dunblane as being the property of the monastery in North Berwick. Records suggest that this first church was replaced by another in 1380. The 1380 church seems to have continued in use after the Reformation swept across Scotland in 1560. Although the new Presbyterian forms of worship tended to be ill-suited to the old medieval churches, a lack of funds often meant congregations continued to use what they had available long afterwards. There is an information board on the site which suggests that the church whose ruins you can see today was built during the tenure of the first post-Reformation Minister of the kirk, Alexander Fargy, who served from 1560 to 1592. Other sources suggest, however, that the medieval church continued in use until 1684, by which time it was said to have been "very ruinous". The new kirk that was then built to replace it is said to have cost £1,000 Scots, at a time when 12 pounds Scots were worth one pound sterling. The builder was a Thomas Bauchop and the original plan appears to have been T-shaped, with a long south wall against which the pulpit would have been placed, and three aisles, to the east, west and north. The accommodation was further increased by the addition of lofts in each of the three aisles in 1686. All that remains of the kirk are the west gable and part of the south wall. 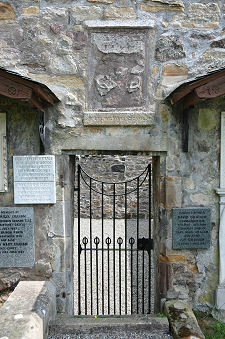 A small window in the latter has a sill stone carrying a date of 1598, which suggests that the kirk built here in 1684 incorporated parts of the structure of its predecessor. 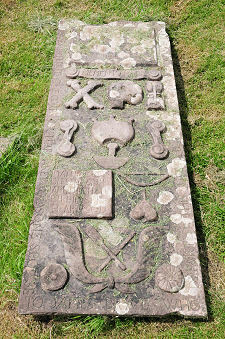 The kirkyard is home to a fine collection of old, and in some cases very old, gravestones. 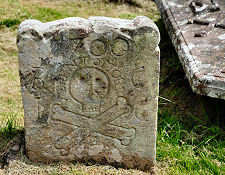 Symbols of mortality such as skulls and crossbones, angels, and hourglasses can be found on a number: these were common from the Reformation and into the 1700s when the traditional symbol of the cross was viewed as too papist for the Presbyterian Kirk. There are also examples at Logie Old Kirk of symbols signifying the occupation of the person buried: including malt shovels, smiths' hammers and horseshoes, and shoemakers' knives. 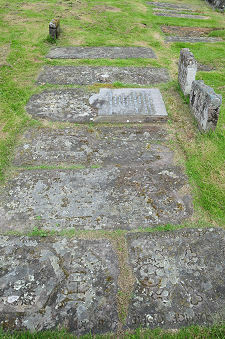 Much older, and rarer, are two hogback gravestones found on the east side of the kirkyard. These are thought to date back to the end of the 1100s, though one has at some point been, literally, smashed to pieces.